As 2016 has now been (mercifully) to bed and we start 2017, it’s worth taking time to evaluate the current Bundesliga campaign at its midpoint. Who’s on the top? Who could use some reinforcing in January? And who should be happy they didn’t spend too much last window? 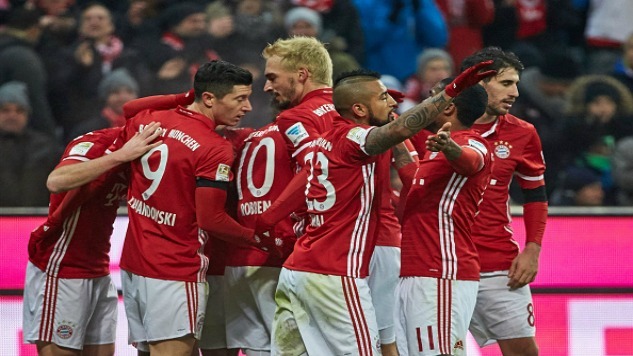 All that and more as we wrap up the best of the Bundesliga in 2016. Sure it didn’t really happen until this fall, but the end of the 2015-16 season was a sign of things to come as Borussia Dortmund finished 10 points behind FC Bayern in Pep Guardiola’s final campaign. The two previous seasons, the margin had been 19 and 13 points, respectively, between BVB and Bayern. Dortmund have struggled since the summer and are already 12 points off the top (currently sixth in the table), but this shows that the league has grown more competitive. Heading into the winter break, RB Leipzig are just three points off the pace set by the Bavarians. The three-point gap is the smallest margin after the first half of a Bundesliga season since 2011-12. In addition, Hoffenheim are the only team not named Real Madrid in Europe’s top leagues to remain unbeaten, sitting pretty in fifth. Appointed head coach of TSG 1899 Hoffenheim on Feburary 11th, 28-year-old Julian Nagelsmann inherited a team mired in a relegation battle. Hoffenheim were 17th at the time he took over, but Nagelsmann guided his side to safety as they won seven of the 14 remaining games. They’ve really kicked on in the new season, thanks to some new signings and greater familiarity with the operational system. Nagelsmann prefers a high-block pressing system that uses three central defenders – a stark change from the cookie-cutter 4-4-2 or 4-2-3-1 that Markus Gisdol previously employed. One of these central defenders, Kevin Vogt, cost just €3 million from FC Köln. Niklas Süle, a Hoffenheim academy product, has evolved into one of the top centre backs in Germany, evidenced by the €25 million deal that will see him move to Bayern next summer. Midfielder Kerem Demirbay (€1.7m, Hamburg) and forward Sandro Wagner (€2.8m, Darmstadt) were absolute steals from former relegation rivals, as the pair have scored 12 goals so far, one more than Darmstadt and only two fewer than Hamburg and Ingolstadt. The young boss knows how to work the market. Nagelsmann is the epitome of the “Football Manager” culture, a young man living the dream as the boss of a club soaring in the league, far above where anyone projected them to be. It was revealed in November that Hoffenheim Director of Scouting Lutz Pfannenstiel found current Liverpool star Roberto Firmino in the computer game, and the club’s willingness to promote youth shows their emphasis is on the future. American Christian Pulisic (18) isn’t the only teenager killing it in Germany. His Dortmund teammate Ousmane Dembélé (19) has hit the ground running since joining from Nice this summer, notching four goals and seven assists in half a season. Pulisic’s rise has been meteoric. He played nine times in the league during the Rückrunde this spring, scoring twice. This fall, Pulisic has scored another two Bundesliga goals and assisted four more, demonstrating his talent to former U.S. Soccer boss Jürgen Klinsmann. New coach Bruce Arena surely will have taken notice as well. Germany has proven to be a breeding ground for young talent the past few years, a fact that’s becoming more and more apparent. With an average age of 24.0 years, RB Leipzig are the most youthful of any Bundesliga side. The energy shown by stars Timo Werner (20), Naby Keïta (21) and Marcel Sabitzer (22) has given them wings to fly to the top of the table, as the trio have combined for 17 goals so far, though they immolated like Icarus against Bayern Munich in the final match of the fall and are in second heading into the winter break. Kai Havertz became Bayer Leverkusen’s youngest ever player to see Bundesliga action when he made his debut in October, at the tender age of 17 years and 5 months old. Havertz has already made nine league appearances. Benjamin Henrichs swapped the left side of defence for the right and became a fixture in the Leverkusen first team at the age of 19, leading to his first minutes with the senior national team. Although they aren’t directly behind Bayern, Dortmund is taking the right steps to reclaim their place as Munich’s top rival. Thomas Tuchel’s team finished the calendar year without suffering a single defeat at the Signal Iduna Park, winning 16 matches and drawing eight. Many of BVB’s key players missed significant time in 2016. Marco Reus was injured for 14 of 32 Bundesliga games played in the calendar year due to injury, Sven Bender missed 20, and Neven Suboti? was out for 23. The aforementioned young guns Pulisic and Dembélé have helped carry the load, but there are still going to be growing pains for Dortmund. Some of these are directly related to injuries, but look for BVB to push onward in early 2017 when the team starts to get healthy. Having survived the relegation playoffs against FC Nürnberg, Eintracht Frankfurt has really kicked on. Currently in fourth, it’s nearly the exact opposite of the club’s final table position in May. The same can be said for Hoffenheim, who finished the previous campaign fourth from bottom and are currently fifth. Achtzehn were bottom at Christmas last season, their turnaround has been nothing short of remarkable. Borussia Mönchengladbach have seen the results go the other way, as they qualified for the Champions League but have disappointed the second half of the calendar year. The same can be said for Bayer Leverkusen, who relied on a late surge at the end of the previous campaign to get back into Europe’s elite competition. In April, Wolfsburg were in the Champions League quarterfinals. Now, they’re down at the wrong end of the table, hovering just above the relegation zone. Wolfsburg just sacked Dieter Hecking, who was subsequently hired by Gladbach. Despite Julian Draxler’s imminent January departure to PSG, they will maintain hope for a better 2017. Hertha Berlin swooned last spring, but repeated their efforts from Autumn 2015 this Fall to claim third place at Christmas yet again. Although the Berliners spent less than €7 million this summer, manager Pál Dárdai managed to upgrade his squad. Eintracht Frankfurt weren’t big spenders either, with an outlay of just €3.3 million, making their turnaround even more remarkable. The same can be said for Hoffenheim, who spent €23 million but received almost €30 million from sales. FC Köln had a transfer surplus of €8 million, and are getting along just fine in seventh, two spots ahead of local rivals Leverkusen who spent about five times as much. In a league where sustainable spending is championed, it’s good to see clubs living within their means and not sacrificing the future for a shot at minor glory in the present. Sure, Jürgen Klinsmann lost his job as US Soccer head coach in November, but the roads he helped pave for Americans playing in Germany remain. In addition to Pulisic’s rapid development at Dortmund, other USMNTers continued to thrive in Germany. Bobby Wood caught fire in the spring, scoring 10 times in eight straight 2. Bundesliga matches for Union Berlin from February to April. That form earned him a move to the top league and Hamburger SV, where Wood has been a lone glimmer of hope for a Hamburg side mired in yet another relegation battle (he’s scored four of their 14 goals). Wood also became a fixture for the national team, finding the back of the net four times for the United States in 15 matches in 2016. John Brooks remains a key component of the Hertha Berlin defence. It’s no coincidence that the Berliners took just one point (against last place Hannover 96) in the four games he missed during the spring. Staying healthy is still an issue for the central defender, as Brooks was unable to take part in seven games for his club in the fall, but played the full 90 minutes in all nine games he was fit for. One of the first names on the team sheet for the USA when he’s healthy, Brooks played 11 times for Klinsmann’s USMNT in 2016, scoring the third goal of his international career as well. Still slotting into Borussia Mönchengladbach’s starting lineup wherever the manager needs him, utility man Fabian Johnson played in seven distinctly different positions (right back, right midfield, right wing, left midfield, left wing, central midfield and shadow striker) in 26 Bundesliga games during the 2016 calendar year. Johnson’s versatility makes it easy for him to crack the first XI for the national side as well, though he usually plays in yet another position: left back. Fabian Johnson lined up on the left side of defence in eight of his 12 USMNT appearances this year, chipping in with two assists. While Julian Green’s time at Bayern Munich may ultimately go down as a missed opportunity, 2016 ended on a high note as VfB Stuttgart announced they had signed Green on a permanent deal during December. The move will go through in January, and the 2. Bundesliga will be the perfect proving ground for the 21-year-old. 2016 also ended better than it started for Timothy Chandler. After missing much of the previous season with injury and falling out of Eintracht Frankfurt manager Armin Veh’s plans, relief came for Chandler when Eintracht hired Niko Kova? in March. The right back has been instrumental for Frankfurt since the coaching change, starting all but three of the 26 (league and relegation playoff) matches since Kova? took over. He’s only missed games due to injury and suspension, and has provided three assists for the resurgent Eagles.